Mixing and proofing the dough went well enough. I realized I didn’t have corn meal so I started to fret about sliding the dough off of the bakers peel (the wooden flat shovel) despite dusting it liberaly with flour. I placed the baking stone on the floor of the oven and turned it up to 450F. While the dough appeared a bit flatter than I had expected, it looked ready to go into the hot oven. 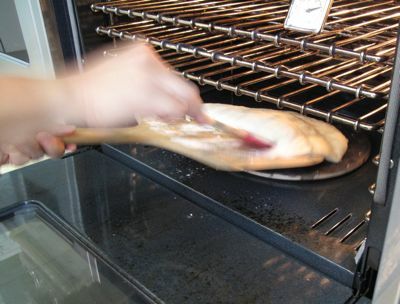 Then the moment of truth, whip open the oven door, place the peel on the baking stone, jerk it like a baker, and hope it slides off onto the center of the stone. ARRGGH! No such luck. It stuck to the peel, I reached for a spatula and tried to help it off, and it resisted, eventually sliding off cockeyed and oozing off one edge of the stone. Disaster assured. I don’t know if my dough was too wet, or the weather too humid, or the corn meal essential, but the dough didn’t behave like it was supposed to. Sliced up it was excellent brushed with olive oil and toasted, served with spaghetti with a tomato sauce. 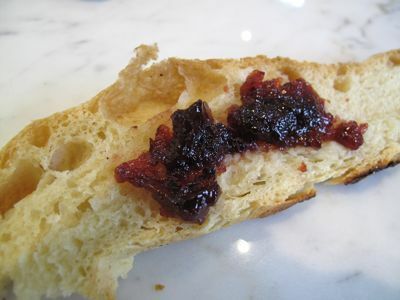 It also was surprisingly good with a damson plum jam we had in the fridge. Just have a close look at the texture of the bread… and if you only saw that last photo, and I left out the ones after the dough, you could have been led to believe that it was all hunky dory… :) But the first photo up top, that tells the true story. Here’s what I do with my free-form loaves of bread: I proof them on parchment paper. When the time comes to bake, I slip the loaf + parchment paper on the hot pan/stone. This way I don’t worry about how to un-stick the dough. Sorry about your finger MM. Not sure about it, but I don’t think you’re supposed to apply ice to a burn. Just put under running water. Oh, did you put mint toothpaste on it? My mom swears it works, not sure though. Your experience reminded me of one of my own kitchen disasters. I was craving for brownies so I preheated the oven, gathered the ingredients and mixed up the batter. I forgot one thing, which was to prepare the baking pan. I had no such luck because I ran out of grease (both oil and butter) and baking paper, so I used cling wrap. Yes, cling wrap. I did not expect that the plastic would melt and stick to the bottom half of the brownie. So, like you, I had to discard the bottom. Ma also gave me a lecture: Better to use coupon bond than cling wrap! My elder son who studied being a chef ran an accident (serious oil burns on the arm) and had to be brought to the hospital. Oooooo that finger must hurt. In doing the leche flan experiments I nearly burnt myself with the caramelized sugar. Luckily,i threw the entire llanera into the sick before it hit my hand. When cooking and I burn myself with oil,I immediately get a cold tomato,open it up and apply it to the area. Luckily,it has always helped. I was just told by one of the elders so that is a first aid I use. Well,guess that’s for minor ones. I always have burnt ointment. Hope your finger heals fast MM!! On wasted experiments: hahahaha you should see my ube puto wastes….argghhhh…..
MM next time you will get burn, just put egg white, its like magic no pain and no blister………….. I remember from a previous post that you brought home some expensive bannetons from a trip to Paris. Have you used them for your bread experiments? It’ll be perfect for this. Yes, I believe the culprit was letting it rise on the peel. Place the stone on the rack (rack at lower third) and a disposable aluminum pan on the oven floor when you pre heat the oven. When you are ready to put the dough in the oven, get some ice cubes from freezer and put in aluminum pan. flour well peel and slowly slide peel under dough. bring to oven and tilt peel and with a quick snap of wrist release dough onto stone. 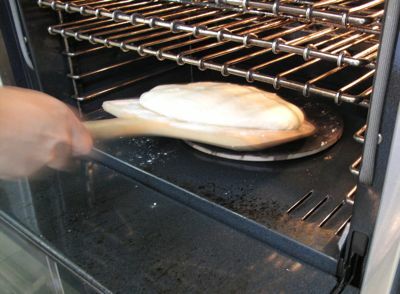 The ice should produce the steam to help the dough rise and when it has melted remove the pan from oven. 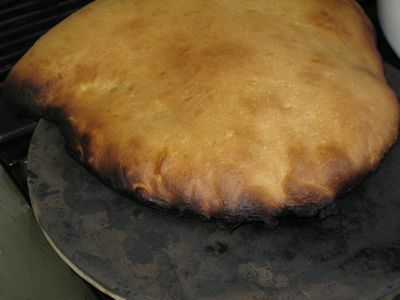 During last 5 minutes of baking, open the oven door slightly to allow whatever steam in oven and bread to escape. Check for doneness by tapping the bottom of bread (should sound hallow). Let rest for a few minutes (for as long as you can withstand the urge to cut a piece!! hehehe) for some carry over cooking. I usually wait for the crust to make a crackling sound. I suddenly remember a movie. A Filipino movie actor Roderick Paulate playing gay role was ironing clothes and suddenly the phone rang. What did he do? He put the flat iron next to his ear instead of the phone. I laugh out loud and to this day I still remember it. So MM be careful when cooking!! MM, What is wrong with photos #2 and #4? You should wear mitts or gloves to protect your hands when handling hot pans and reaching into the oven. The moral of the story. He! he! he! Diday gives you one good reminder there. I also remember we use to wrap our arms with towels when doing fruit pastillas. Mom always had the penchant of doing these and those bubbles are really like little volcanoes spitting steam and lava. We used to take turns stirring and the longer you cook the hotter if becomes, the sticker and harder to stir. We probably love our mom so much to do this for her but they sure were the best pastillas for me. opps.. my eyes? it should be #3 and #4. Hi MM, there’s a great Chinese ointment available in HK that you put on bruises and 2nd degree burns and it works wonders! Much better than Western ointments and your skin heals quickly and looks like new! I know because I always burn myself hehe. You need an aloe plant in your back yard, break off a leaf and the cooling sap does wonders for burns as well as cuts and scrapes. I don’t have one, but I get aloe gel at the health food store and lee it in my fridge. Use that banneton, and turn over onto the peel just before baking. 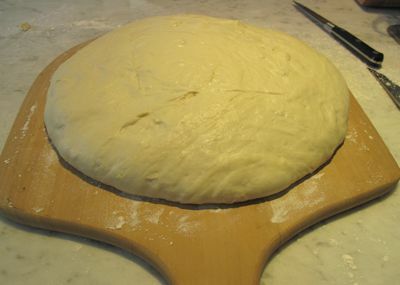 You may want to experiment with putting the formed dough into a le creuset rondo and baking in it at high heat. Too bad they don’t sell home ovens with steam injection, I’d buy one. Artisan chocolate has it right but of course he’s expert. Have you seen the book “About the Bread”? I can cook but I can’t bake. Thanks for this post. You inspire me. I can cook but I CAN’T bake. Thanks for this post, you inspire me. Your “bread” adventure reminds me of my first try at baking bread. I was 11 and wanted to make my own pan de sal. The bread was from a mix, don’t know why, but the dough didn’t rise. I asked our plant supervisor, who used to be a baker, he called it pan de bakal after just touching it. He said the yeast must have been defective. So what to do with all the pan de bakal, sayang naman ang labor, di ba, I cut them up and mixed some Dora rat killer and left it out near the garbage can for the rats– the next day, all the Dora was gone, but all the pan de bakal was still there! Hahaha Linda you made me laugh there! Pati rats ayaw ng pan de bakal…hahaha..funny..
hi. dig your blog. anyway, you’re not supposed to put ice on serious burns. okay for scalds and other minor stuff but not for burns. although cooling might delay inflammatory processes but only up to a certain amount of time. after that its useless. ice results to constriction of ur blood vessels which will decrease blood flow to your injured area and only contribute to the thermal damage. so cool running tap is okay. Linda, that is so funny, im rolling on the floor!!! Yes, I know about molten sugar since I have just experienced it myself last week making caramel for the leche flan, a drop landed on my finger while transfering it from one container to the next. I have this gel for burns that is parked in the kitchen so I don’t have to run very far. Before discovering the gel I also used toothpaste to cool the burn or scalded skin. Hahaha! Linda that’s so funny! your pizza stone is too small and thin. I suggest taking one of your racks to a marble supply shop and have a piece of marble or granite cut to fit the rack. make sure that the piece is at least an inch thick. you can either put that piece on the oven floor and leave it there or use it on a rack. I, myself, got my marble piece from a “Lapidarium” or a place where they make custom “lapida” (cemetery headstones). shouldn’t cost you more than a couple hundred pesos. Oh my gosh. 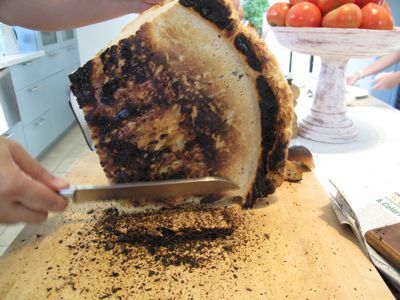 In trying to figure out the burnt bread picture without reading the post, I thought (still think!) 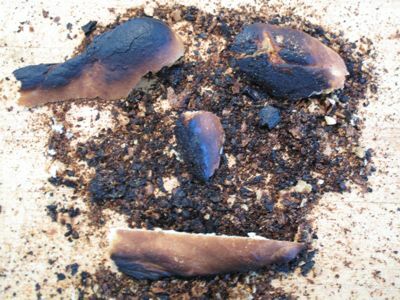 I see a face in the burnt bread and crumbs! I thought tuloy you were going to say you baked bread and the face of Jesus or Mother Mary appeared! Hahaha! Oh my God!! Take a look at the # 6 photo just above the knife and you will notice the face of a cartoon character. Is it Homer of the Simpsons or the Cringe? Oh, I guess you and I are the same. For some reason I cannot bake bread. The end rsult is always a total failure. Kung may green thumb sa plants, may black thumb naman ako sa breads. I tried Artisan Bread (almost the same as your bread except it’s baked in Le Crueset) that was all the rage in food blogs some months ago. It’s supposed to be so easy (no kneading required) that even a 6 year old can do it. There’s even a picture of the blogger’s 6 year old son making the Artisan Bread. Hahaha Ting..don’t worry. I work around the principle my Dad taught me when I bungle up with something totally unfamiliar. When you’re an engineer and you’re a handyman around the house,your children imbibe what you do. Am female but cuz he would talk while fixing say the iron (they had mica then) so you learn because you live with it.I learned to change the mica of an iron,change a busted fuse (no circuit breakers then),use a hammer,change car batteries,what a philips screwdriver is,or a longnose etc etc. Same with THAT 6 year old–he was born into a baking family,so even kneading to him would be second nature. Am sure his dad would give him a piece–and mentor him even at age two how to knead–and you live and learn it. Hubby–when selecting employees(especially skilled workers) would ask what applicant’s parents do. When he needed a welder,those with welder parents would learn faster or know the job than say one whose father was a janitor etc. sorry to hear bout the finger Market man. better to mix some sugar in with the water. that way it doesnt get absorbed by your skin enhancing the blister. I most certainly can relate to your “burns”, MM…and I have the scars to prove THEM…notice the word THEM! …napakarami! This is just a guideline….the % …the base of this is 3 kg, MM …the water %…if it is confusing, 58% of 3kg=1740. Since I already have 1320 from teh sponge, my water in the dough =420 gm. This pan de sal will yield the traditional onw having a semi-lean type of dough. water (total) 56%= 1680-1320=360 gm. I hope this works out for you. This is what I use. Oh, have to have a WOODEN dough cutter for this. ….works really well! BettyQ: Thanks again for sharing your tips and pan de sal recipe. With all the recipes you graciously shared with us, I am awaiting for my lucky star to send my way a venture capitalist to walk into my path so I can open up my bakeshop! I agree, don’t put ice on a burn. The sudden change in temperature from hot to cold will damage more tissue. Put honey instead. It works. It helps soothe the stinging sensation and will heal the burn faster. Hi MM – let me just share with you breadtopia.com – it’s a very informative bread making website that I’ve been checking out – I must say I’ve learned so much from the website’s videos & discussions. Enjoy! Hey Maria Clara: If and when you are ready to open your bakeshop, let me help you get it going and formulate recipes that will be your SIGNATURE baked goodies…there will be only ONE PLACE on this planet to get them…? Bakeshop!!! Hey, MM…here is another one for you to try…the Lengua de Gato I posted on your National Cookie post…but I think the trick is when you pipe it, just let it flow and not squeezing it so you get mound. I tried both ways and I did not like the thick results from the latter. The first one…just letting it flow still with the same diameter of the plain tip used, yielded a product that is thin, buttery, crisp when baked…the way it should be! MM, I just came across a technique for baking bread in a dutch oven instead of a baking stone. Apparently, the usual practice of putting ice on the bottom of the oven doesn’t create enough steam, so the guys at Cook’s Illustrated thought of a better way to do things. The technique they prefer is cooking the dough in a preheated dutch oven so there is less volume of air around it, and the moisture present in the dough is enough to create a steamy environment for good crust formation… If you want to check it out, they have a free podcast that you can access through the iTunes Store. Just go to podcasts, arts, food, then Cook’s Illustrated. Or just search Cook’s Illustrated on the iTunes Store search bar. What do people normally do if they have burns while cooking or scald their tongues while eating hot soups and such ? If you dont have “Solcoseryl Jelly: Skin and mucous tunic regenerating action. Indications: burns, ulcers and venous insufficiency. SolcoserylÂ® Jelly:Suitable for wet wounds” on hand to apply externally. The next best thing is yoghurt, yes the humble yoghurt, the bacteria takes care of the burn on the skin as well as in the mouth. Just place the yoghurt on the burn or keep it on your tongue and voila no more pain or boils or ulcers.